Pittsburg Community Schools is excited to share that we will be participating in a group application for a literacy grant. If funded, the programs, processes, and professional development that will be provided to our district will positively impact our students in the areas of reading, writing, speaking, and listening, beginning at birth and moving through 12th grade. We wanted to get some feedback from you about how you think our school district is doing with our current efforts in the area of literacy. As you respond to each question, please give us your honest opinion. 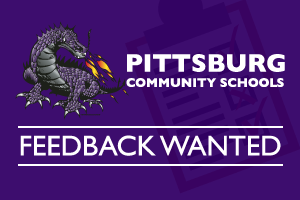 All responses are anonymous and will be used to help the grant development team and our district improve what we do for students in the areas of reading, writing, speaking, and listening. Thank you for your participation and feedback.